But besides all of these titles, Bush was also known as the first baseman for the Yale University baseball team. Even though Bush did so much in American politics, his connection to baseball still always shone through. Bush wasn’t a heavy hitter, but he was slick with the glove and because of his leadership abilities he was named captain of the Bulldogs squad. In 1947 and 1948, Bush, already a war veteran, led Yale to back to back appearances in the NCAA baseball championship. His teams fell just short both times, losing to California and USC respectively. Still, consecutive trips to the championship was no small feat. 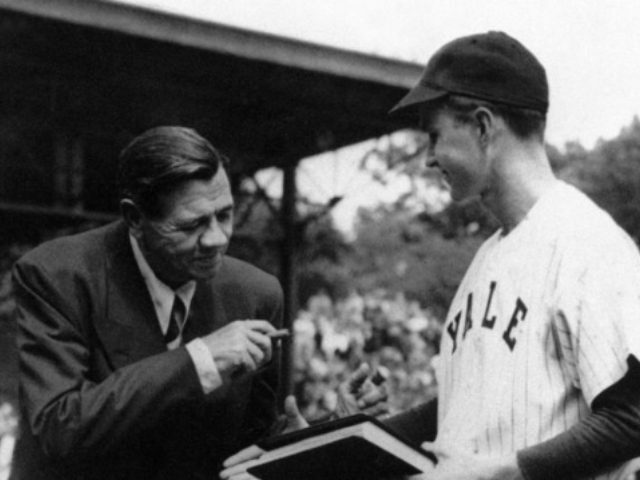 During his stint with Yale, Bush even got to meet Babe Ruth, a moment he was most proud of. After being elected 41st President of the United States. Bush would often carry cards depicting a picture of himself with the “Bambino.” Even the leader of the free world would engage in a little name dropping when that name happened to be George Herman Ruth. In one of his desk drawers in the Oval Office, Bush kept his old Yale first baseman’s mitt. Bush stayed connected to the grand old game all the way until the end. When President Bush 41’s son, George W. Bush (President Bush 43), was managing general partner of the Texas Rangers, the elder Bush supported that endeavor through and through. George H.W. Bush however was a huge Houston Astros fan. He and his wife Barbara were regulars at ‘Stros games. Before Game 5 of the 2017 World Series, both Presidents Bush were part of the pre-game ceremonies. Just days later Houston would win the fall classic for the first time in franchise history. George H.W. Bush loved every moment of it. Along with his beloved Astros, Bush also threw out first pitches for the Baltimore Orioles, New York Mets, and other clubs. He even tossed the first Opening Day first pitch by a U.S. President in Canada when he helped start the 1990 Toronto Blue Jays season in the SkyDome. Baseball meant so much to Bush. America’s president loving America’s pastime meant so much to us. While presidents have been throwing out first pitches for a long time, the Society for American Baseball Research credits Bush as being the first president to actually throw from the pitcher’s mound. In 1989 in Baltimore, Bush fired one home from the rubber before an O’s game against the Boston Red Sox. A former ball player would not have it any other way. Bush appeared in 76 games for Yale, hitting just .224 with 13 doubles, a triple, a homer and 28 RBIs. His glove work however was super. Bush’s fielding percentage was a sparkling .983. When it came to love of the game though, Bush batted 1.000. George H.W. Bush enjoyed much success on the diamond at Yale. He met the Sultan of Swat. Bush had a special place in his heart for Astros slugger Jeff Bagwell, a fellow first baseman. He finally saw his Astros win it all. Bush’s baseball journey is almost just as storied as his journey as an American and a public servant. Yes, we lost an American president with the passing of George H.W. Bush. Surely, that’s what he will be most remembered for. But we also lost a great baseball man. Bush loved his family and our country with all his heart. He also loved our great game. Because of that, Bush will be missed in Houston and across all of the baseball world. George H.W. Bush, baseball player and fan, gone at 94.